If Apple or Samsung released the BlackBerry Z10, everyone would call it boring. But those two companies probably wouldn't have introduced a device with such fanfare. BlackBerry, of course, had no choice. BlackBerry (BBRY), the company that created some of the greatest mobile devices before the smartphone revolution, has had some comical lows over the past five years. Its new Z10, which AT&T (T)and Verizon (VZ) will soon start selling to U.S. customers, is an improvement. But it's not a savior for the struggling company. The hardware is totally fine. It's one of the most perfectly proportioned phones as far as weight, thickness and screen size are concerned. But it's not better in any way than the best phones. The design is clean and attractive in an understated way, but not exciting in the same way a phone like the HTC One is. The battery can get you through the day under moderate use, but it's not extraordinary. The 4G LTE is fast, and call quality is fine. But pretty much all phones do that well now. The 1280x768 display is good, but every other top phone packs a pixel-dense, Retina grade display. The camera is respectable, but its abysmal low light performance means that it doesn't hold a flame to the camera found in Nokia's (NOK) Lumia 920. And its brains -- a 1.5 GHz dual-core processor coupled with 2GB RAM -- is already a generation behind what's been announced by rivals so far this year. BlackBerry needed a phone that could stand up against any other new device. But this is not a flagship phone. It's a device anyone else would be giving away for free with a two-year contract by the end of the year. And for BlackBerry, that obviously is not enough. Still, even if the Z10 had the latest and greatest hardware, it would only be part of the equation. Since BlackBerry maintains its own operating system, the company should be able to differentiate itself through software-centric design and features. BlackBerry certainly improved its platform this time around, but even with the addition of its best new features, the update feels conservative. It's as if the company is wary of alienating its existing user base of corporate and government devotees. So it doesn't matter that the new BlackBerry Hub feature is a wonderful way to keep track of every social network, messaging service, and communication platform in one fell swoop. Nor does it matter that the new BlackBerry 10 operating system has one of the best multitasking solutions since Palm's ill-fated webOS -- which BlackBerry borrows generously from. No matter where you are in the OS, you can swipe up and you are taken to the home screen, where all your open apps are represented by tiles. The problem is there are no apps you're going to want to use. Sure there's Facebook and Twitter. But those are standard at this point. Foursquare? Increasingly irrelevant. LinkedIn? Zzz. Angry Birds? Please tell me you aren't still playing that. Rdio is said to be developing a BB 10 app, but it's still nowhere to be found. You won't find any other major streaming entertainment services like Spotify, Soundcloud, Netflix or Hulu either. Even the stock BlackBerry apps disappoint. The browser is slow, unintuitive and unattractive. And while it functions well enough to get you the info you need, it's not a frictionless enough experience that you'll fire it up like it's second nature. And remember how mad iPhone users were with that awful maps app? Spend five minutes with the one in BB 10 and Apple Maps will seem like a navigational oasis. And there's no Google Maps to choose as an alternative. Despite these criticisms, the one thing BlackBerry can be proud of is its new keyboard. It's the best available on any mobile OS. The keys are well spaced and touch detection is as accurate as it gets. The predictive text feature, which allows you to flick words up to the text entry field, is initially awkward to use, and slower than just typing. But it picks up on some of your conversational habits over time. If there are phrases you use regularly enough, you can construct entire sentences without typing a single letter. Yet here's the problem. The keyboard is geared most towards BlackBerry's loyal core of technological Luddites who have been terrified of touchscreens for the past few years. The rest of the world has more or less adapted to touchscreen typing. While Google (GOOG) and Apple (AAPL) have been feverishly collecting data and acquiring tech firms working on cutting-edge technologies so that they can build out features like Google Now and Siri, BlackBerry has been obsessing over a keyboard and seemingly nothing else. 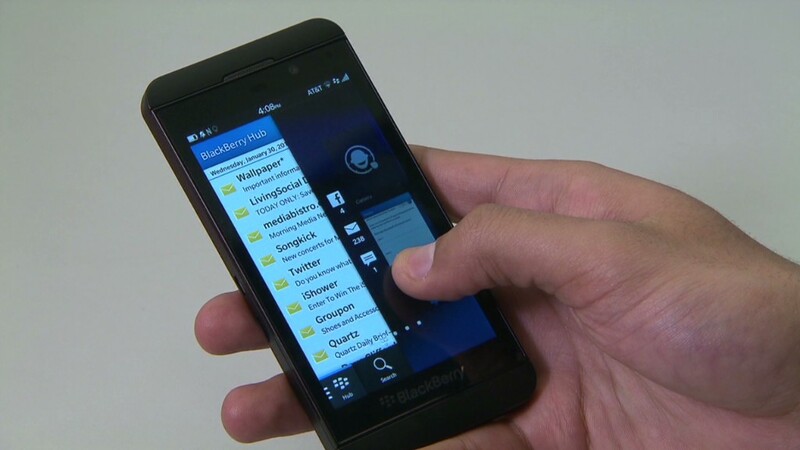 And ultimately, that's the biggest reason to steer clear of the BlackBerry Z10. Everything may be functional, but nothing feels truly fresh or exciting.